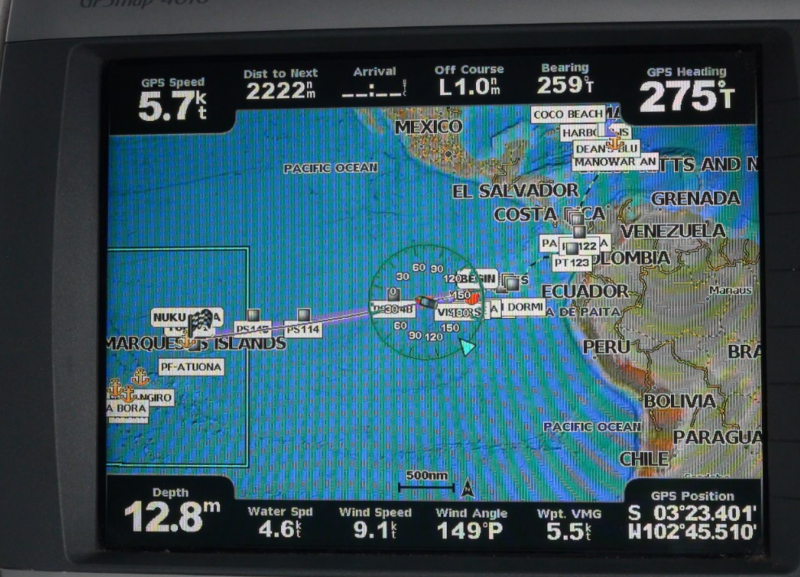 This is our chartplotter screen when we were 2222 nautical miles from the Marquesas. I don’t spesifically remember it, but we probably have the engine on at this point as we’re moving at 5,7 knots but the wind speed is only 9.1 knots. As I am writing this we are coming to the middle of our eleventh day at sea. 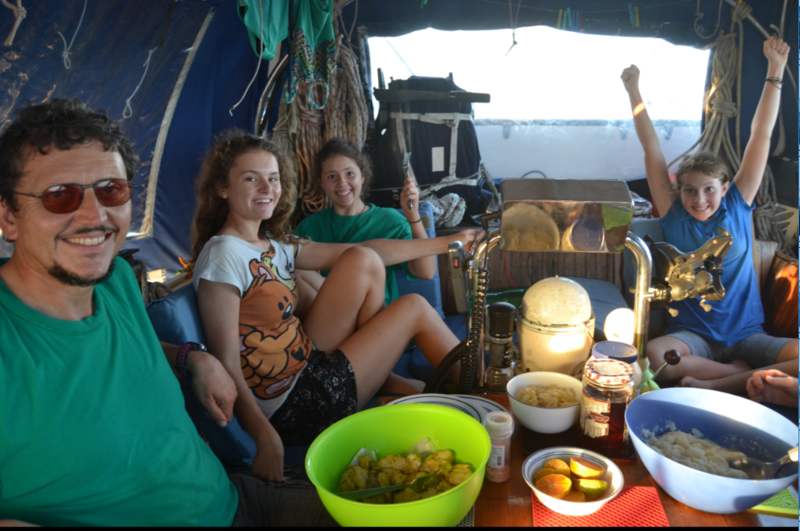 We’ve done 1265 nautical miles so far – another 1776 to go! I am seriously starting to miss being able to walk far distances, it gets a bit cramped on the boat after a while. We’ve more or less managed to find a routine now. Marike and I are taking the opportunity to finally catch up properly with our school work. This may seem strange to some of you, but we’re actually quite enjoying having one month of uninterrupted school routine. However, I do struggle to use my days productively while we’re sailing. I’m not sure if it’s just us or if other sailors experience it as well, but for us it is really easy to just sleep the day away, and then somehow manage to doze at night as well. And it’s so easy to just sit and stare at the ocean and all its undulating waves. . .I know there are other things I need/want to do (like blogging – Marike is trying very hard to make us catch up), but then I end up staring at the sea some more. In the mornings the last watch officially ends at 8 o’clock, so that’s when I wake up. At 9-ish we eat breakfast and do family devotions and then from about 10:00 till 15:00 we do school. At 16:30 we all converge in the cockpit and learn some French out of our “French for cruisers” book (a very useful tool for any boat going to a French-speaking country). And then my mom reads our family book aloud to us till dinner. We all do various activities while listening to the story: Karin draws characters from her daydreams, Sophia either draws or colours in, Marike draws or makes crafts, and I just add a few more patterns to my pattern book. Although, if the boat is too unsettled we tend to resort to phone games rather than pencils. I realise that some of you might be a bit sceptical as to whether we’re actually able to do activities and listen to a story, but the truth is that the activities actually help us concentrate on the story. Honest : ). Unlike most sailing vessels we do not actually have a set designated day watch, the only requirement is that someone should be in the cockpit during the day, and if possible, that person should not be my Dad. Our night watches are very formal though. I’m sure our night watches have been explained before, but because we’ve chopped and changed a few things (and because I like telling people facts ; P), I’m going to explain the watches again. The watches run from 8 p.m. to 8 a.m., with each person getting a four hour slot that overlaps with two other people’s slots. So the watches are from 20:00-00:00, 22:00-2:00,00:00-4:00, 2:00-6:00, and then a wonky watch that gets split into two with the person getting two hours in the early night and two in the morning (from 20:00-22:00, and then 6:00-8:00). Right from our very first crossing it was established that my Dad gets the 4:00-8:00 watch, as he is a morning person and normally wakes up at around four anyway. After much trial and error it has been established that my Mother gets the wonky watch, so that she can spend two hours with my Dad in the morning and (actually quite crucial for the rest of the day’s routine) make breakfast as soon as the watches are over. The rest of us have to cast lots to see which watches we get and then we shift watches after a week so that the unlucky one isn’t stuck with a watch they don’t like. My favourite watch is the middle watch of 00:00-4:00, because you get four hours sleep before the watch and when you go back to bed you can fall asleep in the happy knowledge that the morning is still quite a while off. My least favourite watch is the 22:00-2:00 watch; if we watch a movie or if dinner was a little late, we often get to bed later than 20:00, which means that precious sleeping time before my watch has been lost; also, I always seem to be in a nice deep sleep at around 22:00 and then it’s not fun having to wake up when it’s my turn to go up : /. Marike mostly blogs during her watches (if the weather is calm enough for her to have the laptop in the cockpit) and I do most of my Bible reading in my first two hours. Karin and I help each other memorise Bible verses when we’re together and whichever one of us is with my Dad reads Percy Jackson to him. I’m not sure what Sophia does during her watches, I haven’t had her as a partner yet. So, that’s roughly what our daily routine looks like right now. It’s not monotonous though. The wind and sea is always changing, if ever so slightly. It has been more settled than in our first week at sea. The wind is about 11-12 knots and the water is calm. The calmer the water, the less wind we need in order to move at a respectable speed. We also have a current in our favour, which is helping (although I, for one, am still not entirely sure how there can be a current of 1+ knots in the middle of the ocean). My Dad uses our Satphone to download his emails once per day, and any news received through there is always fun to hear, no matter how little it is. Before starting the crossing we had thought the Pacific Ocean would be almost empty, except for ourselves. It surprised us, therefore, when we saw a fishing vessel marked on our AIS and then saw its very bright lights on the horizon as we got closer. It turned out to be only one of a whole fleet of big tuna factory ships cruising the area. We could see their lights scattered around us that whole night and only finally lost sight of our last one the following afternoon. On a more cheerful note, we’ve also had the privilege of seeing two pods of dolphins : D. In the first pod the dolphins were grey and very big – with an average length of about 2m. 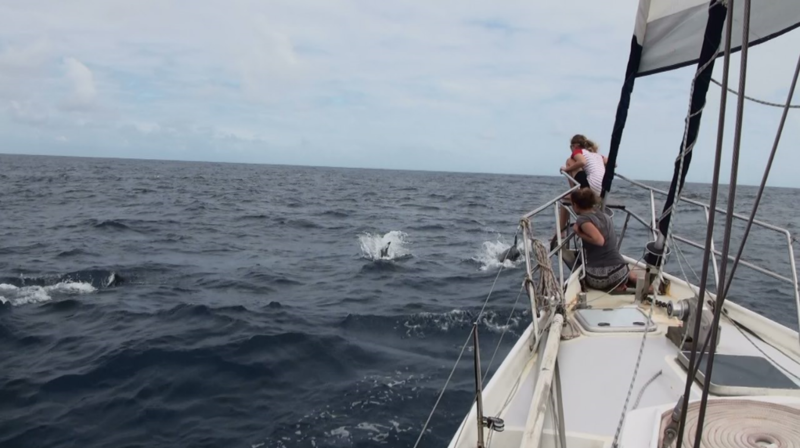 They spent quite a bit of time swimming back and forth at our prow (front of the boat). Our bowsprit is the best place from where to watch dolphins, since it hangs over the water and the dolphins at the prow swim beneath it. While sitting there we can often also hear some of the dolphins chattering clicks and whistles. The dolphins of the second pod were much smaller, and bicoloured : ). Their backs were black/dark grey and their faces and chests were light grey/white, with a very definite line splitting the two colours. These delightful little creatures didn’t stay with us long though, but were soon speeding off in their own direction – disappearing into the light of the yellow setting sun. To our delight they gave us a last show as the whole pod started porpoising into the sunset (jumping completely out of the water and diving in again a second later). The best way to describe it is that they were all engaged in a high speed pursuit. Maybe they were chasing the flyingfish we’d seen a few moments before their arrival, or maybe they were just playing. And then of course, there is all our fish drama. We’ve never been good fishermen and not particularly successful with our trawling lines we put out during crossings. A very big reason for this would be the fact that Sophia and I were the ones mostly driving the project. Since she and I like putting out the lines and like the prospect of catching a fish, but neither actually like eating the fish, we never drove the project too hard ; P. But as of three days ago Marike and my Dad have officially taken over the project. My Dad had enough of reading about other sailors catching so much fish on this crossing and yet we still had managed to land none (and he also actually likes eating the fish, so it makes more sense for him to drive the project). Up until this point we’ve only every really caught tunas – they are difficult to haul up because they’re strong, but once they are out of the water they are no trouble, they just seem to be utterly surprised and shocked not to be in the water anymore. 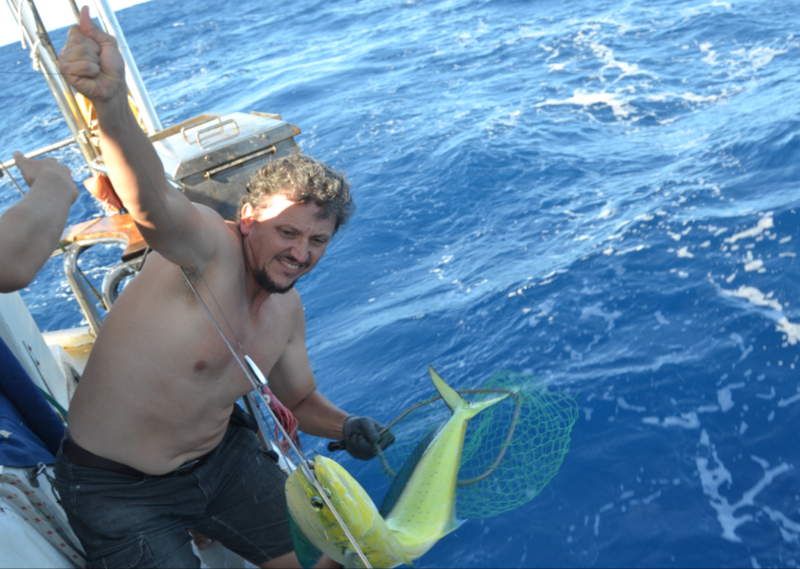 However, here in the Pacific the fish that bite the lures are Mahi-mahi and they are aggressive! These fish do not stop fighting until they’ve been dead for a few minutes. They twist and turn and fight and tug. Thus far we’ve lost two of them while pulling them in towards the boat, and the one we actually managed to get on board managed to twist off the hook and jump off! Marike loves challenges (and also the idea that we can make our stores last longer by supplementing it with fish), and has taken on the project of catching a Mahi-mahi with gusto. 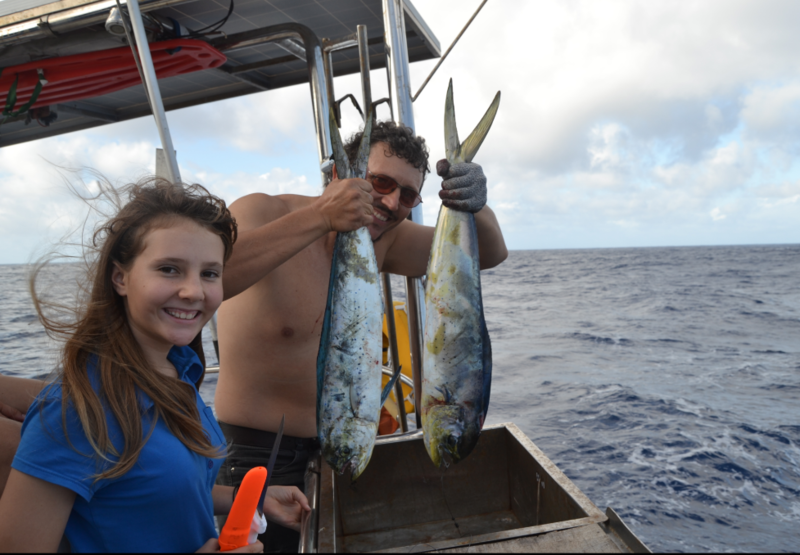 She and my Dad swapped the broken and old lures for new ones and discussed and practiced the best way of getting a Mahi-mahi on board and keeping it on board. We have two trawling lines out, each tied to a ring at the outside of either side of the cockpit. From the rings the lines go underneath the safetylines and into the sea. Our lines consist of a short piece of rope attached to a piece of bungee cord (which takes the strain and prevents the fishing line from snapping if a particularly large fish should grab the lure). Up until this trip we never actually knew when we caught a fish, we just sort of checked the line every now and then and hoped the fish hadn’t been stuck on the lure for too long before we pulled it out. Ahem. Anyway. . .My Dad came up with a very easy and simple solution: he put a washing peg on the lip of the cockpit and hooked the rope of the line over the peg; when a fish jerks the line the peg jumps off with a nice crisp snapping sound and voila, we know we have a fish : P.
Hooray! 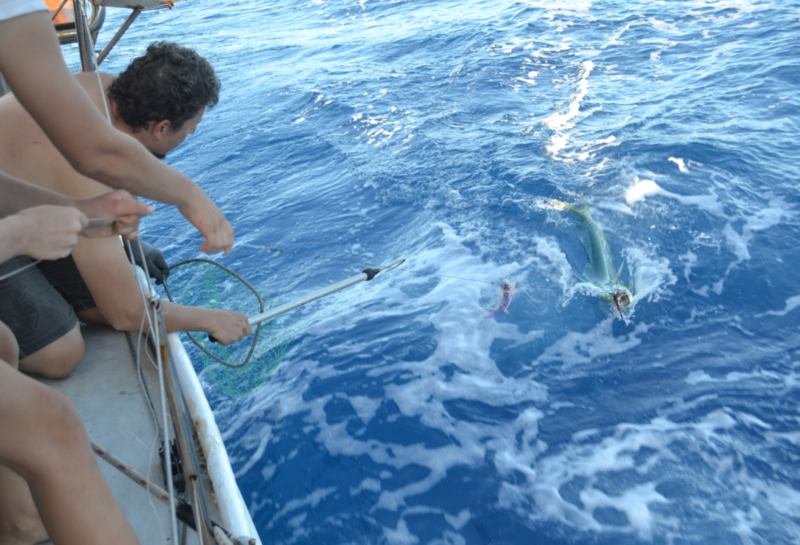 I do have lovely Mahi mahi fish fotos to put on this blog : ). We must’ve sailed through a school of them, because both of the lures were taken at the same time! Sjoe, dit is so interessant om te volg wat julle aanvang. Dit lyk na baie pret! Om so van plek na plek te reis, om konstant nuwe mense te ontmoet is so ‘n unieke en wonderlike geleentheid om die evangelie te bring. Ek bid dat julle woorde en getuienis van die evangelie van Christus talle mense aanraak sodat hulle ook die ewige lewe kan hê. Baie groete en seën vir julle uit Suid Afrika!